Consequent rebound shots after the initial save are one of the hardest jobs for a goalkeeper to deal with. Unable to clear the ball and with going straight back out into play, further shots are guaranteed, with the shooter having more and more chances to bury it. The longer the ball stays in the D, the more chances the opposition has to shot in on goal, so you want to do all in your power to get rid of it. These are the types of situations that can either be a goalkeeper’s recurring nightmare, or their team’s saving hour! If you do have to face multiple shots, then you want to be able to react to each one – concentrating on the single save each time to maximise your ability to stop the ball. ‘Keeping your head on’ and staying confident will make the save much easier to complete as you are comfortable in dealing with the pressure of the situation. Don’t ‘lose your head’, diving around all over the place and putting yourself in danger. If you have to run back or across into cover open space, then be calm about it; using speed, but concentrating on the related angles and appropriate positioning to the shooter. The sooner you get there, the more area you can block if the shot comes in (if the shooter takes their time, then you have even more of an advantage!). With the shot coming from the other side of you, as a pass is made, or the ball was redirected there, you will have to race back to cover the changed angle. If the shot is closer in (i.e. it went to outside of you on the save), then you can step and shuffle across to move into the space and shot. Getting into the ‘zone’ really helps. As soon as you get going, you’ll feel unstoppable. But don’t forget to clear if you can, otherwise all your attempts will be fruitless. After the first save, you need to react instantly to be able to cover open ground. If the shot is raised, try to stay on your feet as the ball could end up going over you; unless it is not possible to do so. The longer the ball stays in the D, the more time and opportunity the opposition has to score. Get rid of the ball as soon as possible. If you are alone with against the attacker (i.e. you have no defence and are left to deal with the play), then you can run out to meet them. By reacting quickly and instantly running out to meet them in-tight, you immediately close down the available shooting space and force them to move around you, or shoot straight into you. If the shot is released then you are in a capable position to stop it – being on the ‘doorstep’ to cover the strike. Come out and close down the attacker to limit their shooting space. If the shooter is alone then come out and challenge to make their life harder; only a good shot should beat you. If there are multiple shooters then ‘hang back’ and react to it, as there are more options to deal with and more space to shoot at. If the shooter does move, instead of shooting, be ready to move with them and tackle of stop a shot. When making the save, you want to be able to clear it away as soon and as safely as possible, so that further opportunities can’t develop. By getting rid of the ball, you are effectively stopping any further chance of scoring – shutting down the opposition. The best place to put the ball is out to the sides or the back line, where attackers cannot get hold of it, as it is now out of play (try to clear the rebound on the save, but you can use a kick if needed after the initial save). If not, then kick it as far as you can away from danger, preferably outside the D, so that you have time to recover, reposition and get set for the next shot. Otherwise, try to get it to a defender who can then clear it away with their stick, or pass to another team mate to keep hold of possession. If the ball has gone out on the save, depending on the rebound quality of your kickers and pads, you will have to chase it down to get in reach of clearing it. Don’t be static or laid back; actively come out to get to the ball and make a strong clearance out of harm’s way. That way you will be able to respond better and get more behind it, as you have more time to think and see the space available. Be decisive: take charge of the game. Remember: you can’t intentionally kick the ball back line after the shot is stopped. If you do, then you will be penalised with a short corner (the sidelines are still okay though). On making the save to push away, it needs to be a fluid single movement; angling the kicker or pad to turn away the ball in the correct direction. You should focus on each save as it presents itself – concentrating on that shot singularly each time. Your priority is the first save: make the save and eliminate the rebound, and you prevent any further scoring chances. No more chances means no goals. Lots of coaches teach the maxim (saying) of ‘one shot only’. They want professionals at the top of their game to make that one save on that one shot – they don’t want them messing things up by giving the opposition more opportunities than they should have. If you watch football/soccer and look at the way rebound goals occur, then you should learn for your own game; say if a keeper ‘spills’ the shot; dropping the ball or failing to smother it, it is all too easy for the shooter to come in again and put it past the downed keeper. 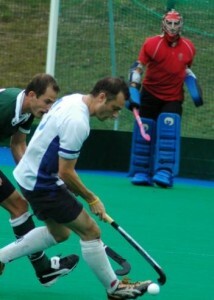 Focus on the first save – prioritise the save and the controlled clearance of the rebound. Don’t give away further chances. Want to know how to get the best comfort and lifespan from your new OBO kickers? Click below to view the presentation on how to condition your kickers. Many thanks to Animal for his content input. Getting into the stance, when the action is not specifically close, is something that troubles a whole range of keepers with saving and decision making ability, which can cost them in the game. It is so important to get into your ready stance before the stance – the better prepared you are, the more chance you have of stopping the shot. You can never not bother with getting into your stance before a shot. Even when the ball is under one of your player’s control, you don’t know if they are going to have it taken from them and go onto have a scoring chance. I’ve recently been watching a number of keepers who are incredibly lazy in their efforts. Other than not being ready for action and not making the save, you are not mentally prepared for game action. If you are not capable of being alert and watchful all game long (along with the need to pull off big saves when called upon in the last few minutes of the game), then you shouldn’t be getting selected to play. By not being in your ready stance and being ‘behind the play’ (i.e. not watching it properly and keeping a back seat), you leave yourself vulnerable. If you are unbalanced in your stance, then you will not be capable of making the save; tilting too far backwards, unable to reach the ball. A great example of this was Des Abbott’s goal that Vogels allowed in the bronze medal match at the Olympics; allowing a goal through the legs as he wasn’t set, falling back and letting it through him. If he had however been ready, he could have closed the gaps by bringing his legs in. There are a few British national league keepers who still regularly fail to get set in time; a goal on a broken play within the D at a national conference league game I watched over the weekend is such an example. Expecting the umpire to call the other way (as the team had got most of their decisions their way), the goalkeeper was standing at the post, not in a suitable stance, the ball got loose and was then smashed in. By not being set for the shot, he was easily beaten, unaware of the impending danger. 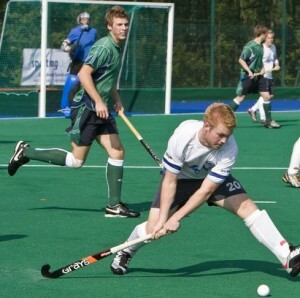 In contrast, by being in your ready stance when the play is around you (and your defence; getting sucked into the idea of your role as shot stopper, is not the right idea), you are ready and raring for the save; your gloves up for the incoming shot. It is no good just getting into your stance when the play gets in close; if you are caught off guard when a change occurs, like a deflection, then you are responsible for your lack of attention that led to that goal, by simply not being ready to make a save. By getting set before a play develops, you also help reduce the mental stress of waiting to see a shot in a tight game, since you are ‘switched on’. The best way to judge the play is to watch and stay with it the entire game. As the ball gets closer, you need to ‘switch on’ and get to where it is on the pitch; moving with the ball as it moves and staying in your stance, ready for anything to happen. By point of rule, if the play is in your half, you should be within your ready stance, ready for shots outside the D: you never know what’s going to happen next and should therefore always be alert and ready for anything (i.e. a pro technique is to put in a ball for a runner to get on the end of for a deflection, or a two on one that develops after a defensive mishap). By getting ready in your stance, with your hands up and body forward, before a play is even made, you WILL be ready for an unprepared save, compared to other keepers who will get caught short by their inactive laziness. Just watch the pros and see how they do it, like recent games in the Olympics (Vogels is a great example, except vs Australia) and you’ll understand. As the play gets closer you are nearer and nearer to, you are ever more likely to face a shot. would not be ready for it. and his legs are apart in his stance, ready for action. This is not just a problem that plagues our sport: if you watch (on Match of the Day [British TV] or anything similar), you’ll notice how the keepers that don’t bother to get set lag behind the play and allow goals out of failed ability to prepare for the shot. In national league games I’ve watched keepers stand there stock still not even bothering to get into a ready stance, on free hits and plays around the D, when they should honestly be set in their stance, ready for a shot. Just because a team is weaker than you are and you are winning, it doesn’t mean there is any reason for you to switch off and sit back; for all you know the next play may go against you and you are beaten, when you aren’t mentally or bodily (position) set. You have to be aware of your own attitude to the game to really succeed. If you don’t look ready, then shooters will pick up on this; rather than taking a ‘back seat’ during games, concentrate on being there all the time to deal with whatever comes your way. As always, practise is key to success: train yourself to ALWAYS be in your stance and on the angle of where the ball is, to be set. At training, focus on getting yourself in your stance immediately and in line for the shot, allowing you to maximise your chances. 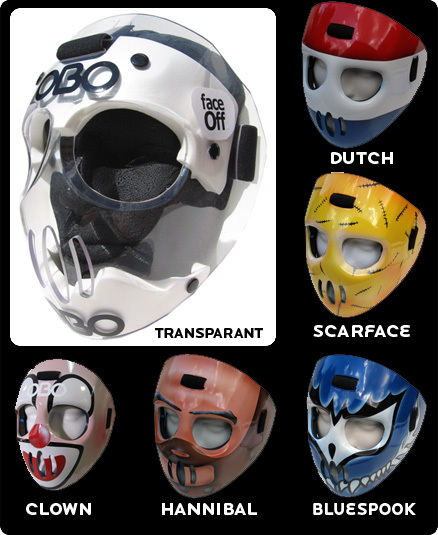 Check out these limited edition custom Face Off paint jobs produced exclusively for Verbunt Hockey, Netherlands. The range of graphics are sure to give you attackers a scare on shortcorner plays. To get one of the exclusive Face Off designs click here to go to the Verbunt pages. The OBO FaceOff has been developed specifically for the short corner phase of Field Hockey and is not intended for full game usage. 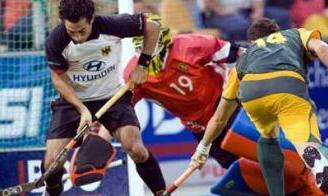 It is designed to reduce cuts, abrasions and bruising of defenders. Wide and comfortable elastic strapping…easy to pop on and off. Rigid yet light polyethylene shell…unbreakable. Total shell weight is 150 grams. Anatomically shaped eye sockets designed to maximise vision while still providing excellent protection. Medium density polyethylene foam inner provides comfortand aids protection of key areas…forehead, check bones, temples and chin. High density polyethylene foam goggles reduce frontal and side impacts over key areas…the bridge of the nose, eye sockets and cheek bones.